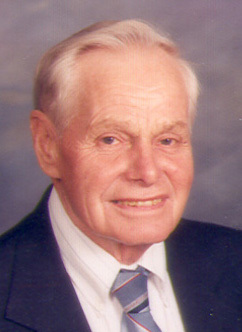 Andrew Bernard Kampwerth, 81, passed away peacefully August 21, 2005 at his home surrounded by his family in St. Rose, IL. Andrew was born in St. Rose, IL on January 18, 1924 to John Bernard and Clara (Schumacher) Kampwerth, who preceded him in death along with brothers, Bruno and Jerome, and sister, Geraldine and Sisters-in-law Irma Kampwerth and Verena Schrage. Like so many of his generation he developed his values for faith, country, family, and hard word on the dairy farm southeast of Highland during the depression helping his family. He worked on farms for Syl Schumacher and Mary Buehne during the 40’s. He began his Marriage April 3, 1951 to the love of his life, Anna Jean Schrage on a farm southwest of St. Rose, IL and was a dairy farmer for 36 years. He is survived by his beloved wife of 54 years, their children, Jeanne (John) Leatherwood of Richmond, TX, Terry of St. Rose, Ron (Virginia) of Klamath Falls, OR, Carolyn (Jeff) McDonald of O’Fallon, Steve (Michelle) of Birmingham, AL, and Jeff (Amy) of St. Rose. His beloved grandchildren, John, Brian, and Michael Leatherwood, Ryan (Friend Brandi Starko), Brett, Lindsey, Adam, and Avoynna Kampwerth, Brandon (Kari), Bryce, and Brianne Kampwerth, Andrew, Alexandra, and Jack McDonald, Olivia and Avery Kampwerth, and Elyse and Abbi Kampwerth. Great-grandchild, Alexis Kampwerth. His brothers, Alfred (Agnes), Jerome, John (Mary), Robert (Darlene), Jim (Dorothy), Ralph and Gerald (Agnes) and sisters, Mary Edith (Lewis) Haar, and Marietta (Louis) Winkeler. In-laws, William Schrage II, Pat (Al) Vonder Haar, Victoria (Tom) Book, Sr. Mary Jane Schrage, ASC, and Linus (Emily) Schrage. Many nieces and nephews. He will be sadly missed by dear friends, neighbors, and Euchre playing couples. He was a proud member of the St. Rose Church, Men’s Sodality and Choir, St. Rose Development Club, and Holstein Friesian Association of America. The family will receive friends and relatives on Tuesday, August 23, 2005 from 4 to 9 PM and again on Wednesday, August 24, 2005 from 11 AM to 1:30 PM at the Moss Funeral Home in Breese. A Mass of Christian Burial will be on Wednesday, August 24, 2005 at 2:00 PM at St. Rose Catholic Church with Fr. Edward Schaefer officiating. Interment will follow in St. Rose Cemetery.